Lewisham’s local government workers are calling for an end of the system of an executive, directly elected mayor in Lewisham and are calling a meeting to discuss this later in the month. 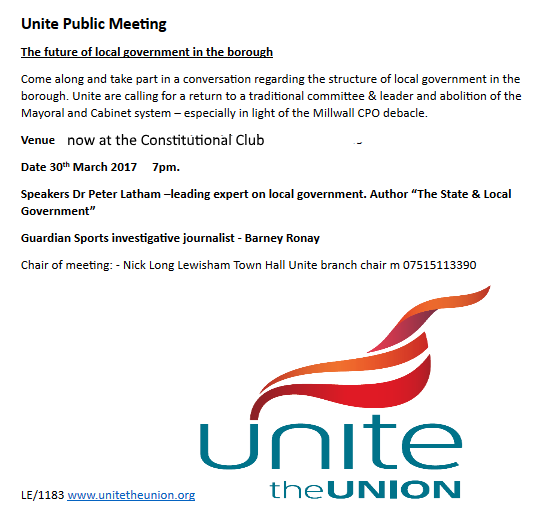 Add to my Calendar 30/03/2017 07:00 PM 30/03/2017 09:00 PM Europe/London Unite the Union: The future of local government in Lewisham Come along and take part in a conversation regarding the structure of local government in the borough. Unite are calling for a return to a traditional committee & leader and abolition of the Mayoral and Cabinet system – especially in light of the Millwall CPO debacle. Date 30th March 2017 7pm. There’s been a venue change!